A former Nazi WWII camp for POWs, later overflow concentration camp, in fact one of the most significant such sites in northern Germany. 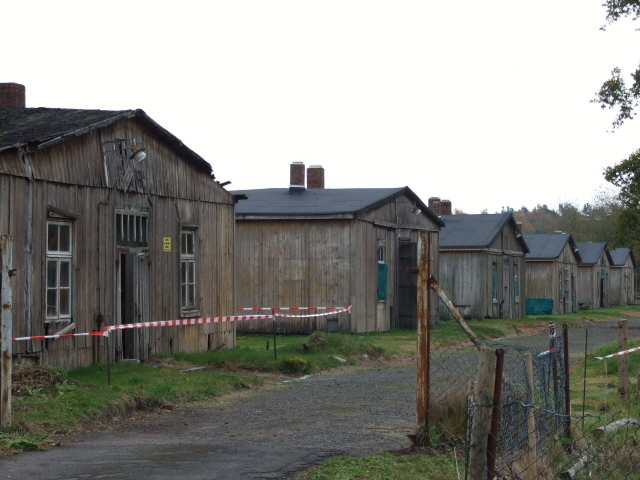 What the much better-known Bergen-Belsen camp memorial site lacks, Sandbostel still has: namely surviving original structures, especally the wooden barracks, which are currently being carefully refurbished. There's a modern musem now too, as well as a couple of new exhibitions in some of the more recently restored buildings. More improvements are planned. More background info: Sandbostel is a pretty desolate and isolated location, back then surrounded by boggy plains with little infrastructure – in the middle of nowhere, as it were. In other words: an ideal location for a POW/concentration camp. 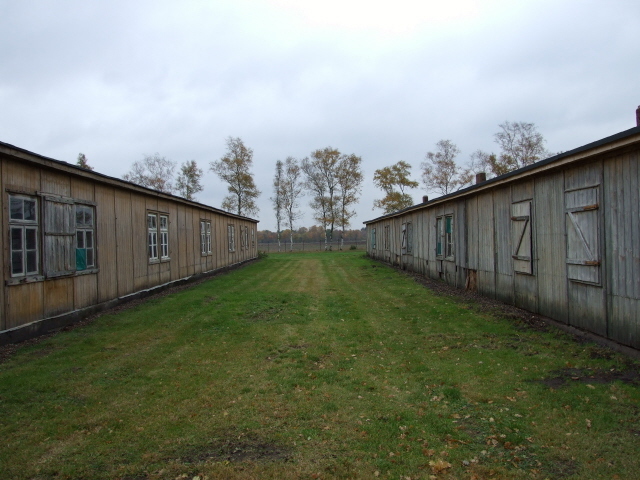 Initially, the camp was set up as "Stalag X B", and was at first a tented camp for POWs from Poland, France, Belgium, and, increasingly from 1941/42, the Soviet Union. All in all, however, inmates from over 70 different nations passed through Sandbostel. Tents were soon replaced by buildings, both of stone and wooden barracks – in the end there were a total of 150 buildings lined up on either side of the central camp road. Up to 70,000 prisoners were crammed together at any one time in the camp (which had originally been planned for 10,000). Conditions were predictably atrocious. The death rate was, naturally, particularly high towards the end of WWII when the camp was overcrowded, supplies were running out and the camp was also used, just like Bergen-Belsen, as an "overflow" camp for the inmates "evacuated" from concentration camps further east, e.g. from satellite camps of Neuengamme. Sandbostel was liberated by British forces on 29 April 1945. 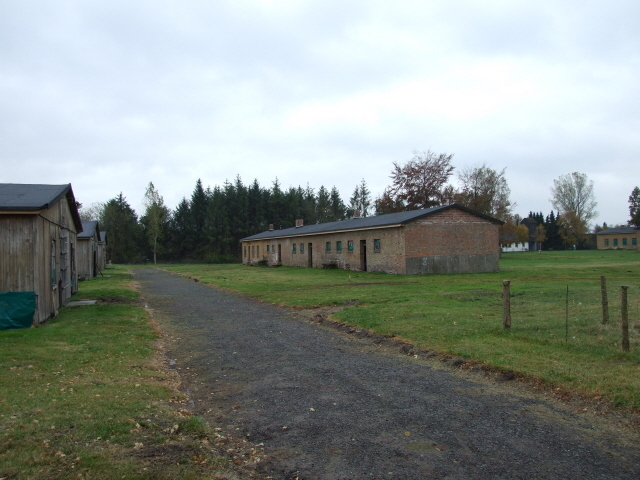 A couple of months later, after the end of WWII, the camp was used to intern former SS and other Nazi personnel. A typhoid-infected part of the camp was burned down by the British, but other parts were retained. 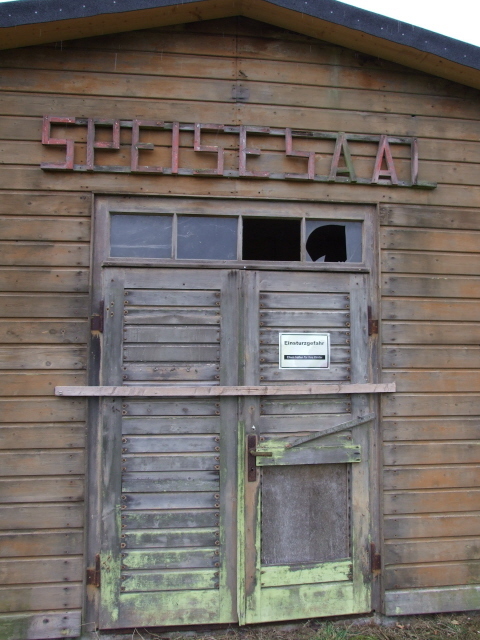 In the 1950s, the camp then served as a transit camp for refugees from the GDR. 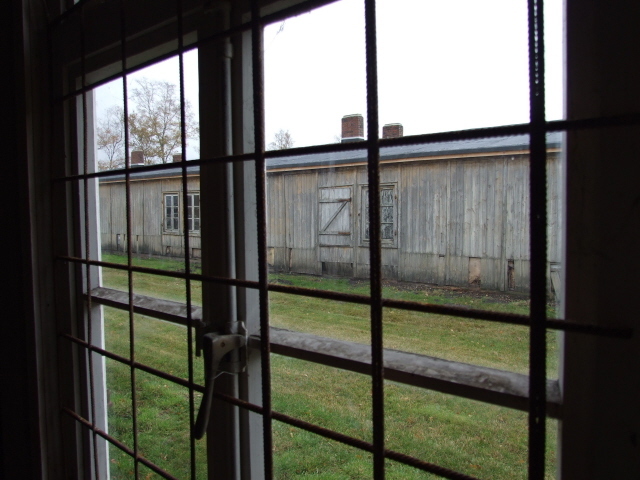 During that time the camp facilities were modernized and provided much improved conditions compared to the days of the site as a POW camp – but this applied mostly to the interior of the buildings. Thus the original appearance of the barracks' exterior structure largely survived. From the 1970s, though, when the remaining area was turned into an industrial estate, unused buildings began to deteriorate, and the area was inaccessible to the public. This only changed from 1992, when the 25 remaining barracks and other edifices (out of the original 150) were declared listed buildings and a society for their preservation and the documentation of the site's history was founded. Many buildings are dilapidated, but others have been preserved. Work is still going on. Since 2007 there had been a little museum at the site in a newer building, as well as temporary special exhibitions, housed in the original barracks. Meanwhile a proper, contemporary museum exhibition has been set up in a yellow brick building. And on my last visit in May 2014 a brand new exhibition had just opened in a restored building at the back of the complex. Furthermore there was an ongoing project of displaying inmates' registers on coloured laminated sheets on a wall in yet another recently restored building. More is planned, once the documentation centre has been able to purchase the rest of the grounds (and its crumbling ruins) from the current owner. After that, these parts will in some way be integrated into the memorial site as well. The centre's staff are extremely committed – on my first visit the curator of a special exhibition took us around even outside regular opening hours and showed us parts of the barracks not normally (yet) open to the public. And on my last visit I followed a regular guided tour lead by an extremely powerful lady teacher who also outlined the future plans for the site. Among the group was also a Russian descendent of one of the camp's inmates ... which made the experience even more intense. It is good to see that this originally rather obscure memorial site has been able to do so much work in recent years and is slowly getting more recognition as well. What there is to see: The premier attraction of the Sandbostel site is the fact that here a row of original camp barracks has been preserved. And that is an extremely rare thing! 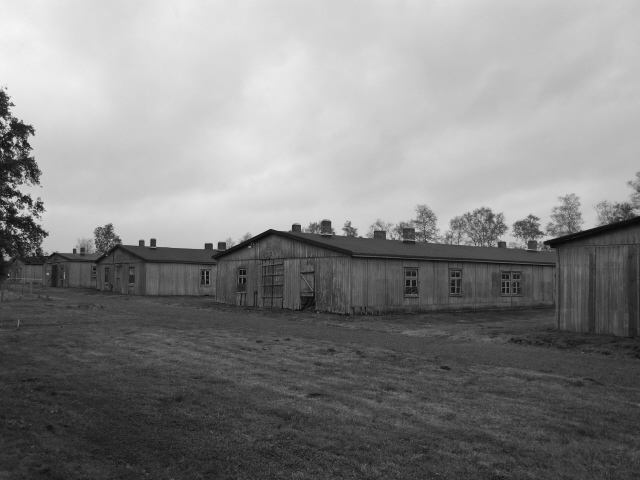 The better-known and more popular Bergen-Belsen site, for instance, has none at all – and even at those camp memorial sites that do have barracks, these are typically reconstructions, not originals. So this really sets Sandbostel apart. I first visited Sandbostel in October 2009, just two years after the memorial had opened. Back then there was only a fairly small, monolingual (German only), and somewhat improvised exhibition in a brick side building. And in one of the old wooden barracks a temporary exhibition could be seen which included some ultra-rare original documents from the build-up to WWII and everyday life under the Nazis. We were also shown the inside of a couple of the other wooden barracks. These were mostly empty but occasionally some intriguing wall paintings could be spotted (e.g. of Gdansk sights or East German cities' coats of arms – apparently left from the days when GDR refugees passed though the camp). But most of the former camp's buildings were out of bounds and many looked so dilapidated as to appear beyond repair. In May 2014 I went on a return visit to Sandbostel – and was impressed with the improvements that had been achieved over the past four and a half years! I knew that an extended and modernized museum exhibition had been set up in a separate, yellow brick side building, but there was so much more. 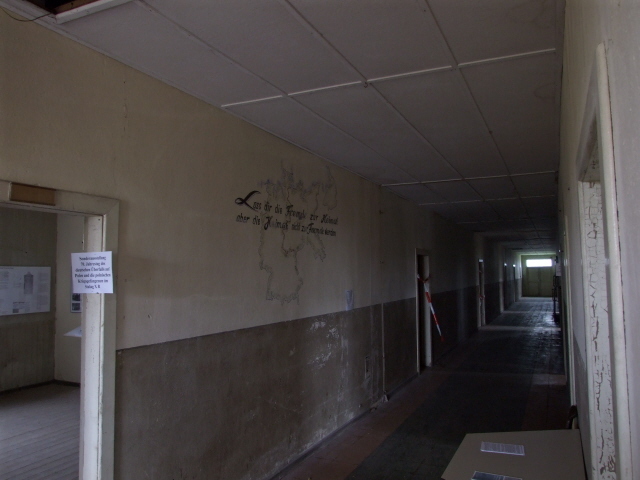 I joined one of the Sunday guided tours, which started at the main museum building and covered much of the ex-camp's territory, including the inside of buildings still undergoing restoration. I'm using the word restoration loosely here, as we were told that it is not the aim of the Sandbostel preservation society to restore any barracks to the appearance they would have had during WWII (e.g. painted in bright colours), but rather carry out only careful structural refurbishment to simply preserve the current state. Nevertheless, we were shown a completely new separate exhibition in a pretty thoroughly restored barrack towards the western end of the premises (near the modern church). The topic of this exhibition was the story of the Sandbostel site after the war, from its liberation by the British Army, to its uses as a transit camp for GDR refugees, the West German military, and as an industrial estate for small businesses (which to this day occupy parts of the ex-camp). It also covers the long struggle for the establishment of a proper memorial at the site which took so many years to become a reality. In the former kitchen building there was a temporary exhibition and the wall of one large hall (used as a sort of auditorium, going by the rows of chairs occupying much of the floor space) featured a floor-to-ceiling display of coloured laminated sheets. These were reproductions of individual inmates registration files. 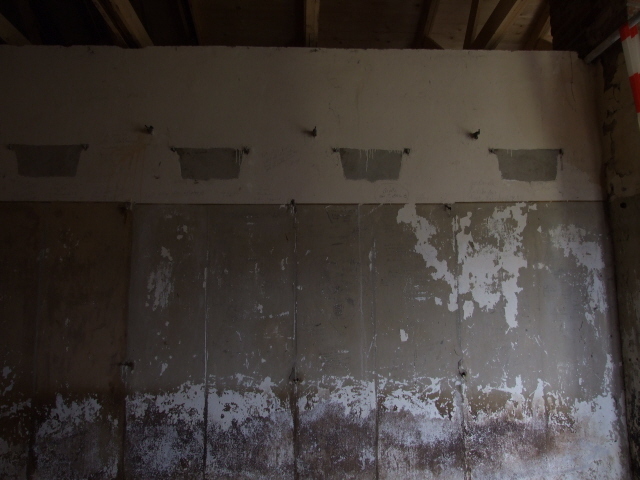 The mass of sheets gives an indication of the sheer number of prisoners who passed through Sandbostel camp while at the same time restoring them some of their individuality. Of the old former living quarter barracks we were given only a brief glimpse on this recent tour – and the old exhibition I had seen in 2009 had gone. However, we also had a chance to see the same documentary films, which were still shown in the building that previously housed the main exhibition (and still houses the memorial administration). On offer are three films. The first two items are ca. 5 to 10 minutes long each – and contain silent footage shot by the British liberators in April/May 1945. These are pretty self-explanatory – but the memorial's staff may also provide extra commentary. A third and most substantial film is a somewhat longer piece (ca. 20 minutes) from German television. It's a documentary about the site which features a woman who, like may other "ordinary" Germans, was sent into the liberated camp by the British after liberation to work – namely clear the camp and look after the remaining sick ex-inmates. Her reading from her diary notes she had written back then as a 17-year-old are particularly revealing and touching. Also featured are two Brits, who were with the occupying forces then. One speaks English – but it's dubbed into German. So if you don't know the language, you can either skip the longer documentary or only watch for the atmosphere derivable from the visual. The principal focal point of the current Sandbostel memorial site, however, is the main exhibition right by the car park. In contrast to the former exhibition, which had a slightly amateurish and low-tech feel to it (and was entirely in German only), the new exhibition is state-of-the-art modern and features contemporary interactive media, but without that latter element being too overbearing. Having individual access to eyewitness interviews/reports is indeed an extra bonus. Another massive improvement over the old exhibition from the point of view of international visitors is the fact that the exhibition is now bilingual, German and English, with a high standard of translation quality. Not all the texts have been translated, however. While all the main section texts are in German and English, most of the labelling accompanying specific exhibits is still in German only. But nevertheless, non-German speakers are now much better catered for than before. There are also more artefacts on display in the new museum, many archaeological finds obtained during digs around the site itself, but also items from further afield, some on loan from private collections, e.g. a camera with which a French inmate managed to make clandestine photos of life in the camp. Some prints of shots taken with this camera are on display too. Attached to the main exhibition is an apparently freely accessible library room. This also features a section with books and brochures in foreign languages, including a dozen or so in English – amongst them the memories of Clifford Barnard, a member of a British ambulance unit, who had come to Sandbostel immediately after the liberation to witness the full scale of the horrific conditions the remaining prisoners had been left in. All in all, this is a real find! A treat for all those interested in the history of such camps and the stories revolving around them. It may not (yet) have the same degree of professional commodification and is a lot less hi-tech than say Bergen-Belsen or Neuengamme (the nearest "competitors" so to speak), but the Sandbostel memorial site makes up for that by originality and authenticity. Location: At Greftstraße 3, a bit over a mile (1.5 km) south-west of the actual village of Sandbostel, which is some 20-25 miles (30-40 km) east of Bremerhaven and ca. 40 miles (65 km) west of Hamburg. Access and costs: a bit remote, requiring a car to get there; but free . Details: to get to Sandbostel you'll need to have your own means of transport. From the main motorway between Hamburg and Bremen (A1), get off at exit 49 (Bockel) and take the B71 towards Zeven. Pass through Zeven and carry on along the B71 until you've passed through Selsingen, where you turn left towards Sandbostel. Follow the signs to "Gedenkstätte"/"Kriegsgräberstätte" – at some point it said only "Gewerbegebiet (Immenhain)", but that's where the memorial site is. Wheather the sign-positing has been changed/improved in the meantime I do not know. 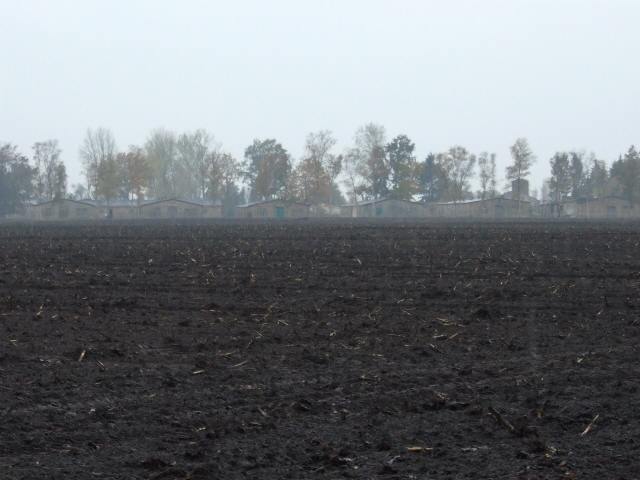 The former cam is a bit less than a mile (1.5 km) past Sandbostel village proper, but on the approach you can already see the row of barracks to your left. Just before you get to Heinrichsdorf, turn left into the premises of the industrial estate and proceed straight ahead, until another sign points towards the memorial site proper, where there are a dozen or or so parking spaces in front of the yellow building that houses the main exhibition. Opening times: The row of barracks which are part of the memorial site can be seen from the outside at any time. The exhibitions/documentation centre are open Monday to Friday 9 a.m. to 4p.m., and on Sundays and public holidays from 10 a.m. to 5 p.m. – in addition, scheduled guided tours (in German) take place every second Sunday of each month at 1 and 3 p.m.; to arrange for different times or a tour in English, phone 04764 2254813. Time required: If you can understand German you can easily spend significantly longer here. The guided tour I was on lasted about 45 to 60 minutes. But this does not include the exhibitions. But the most significant thematically and, at a push, geographically combinable other site will have to be that of Bergen-Belsen, which is about 60 miles (40 km) further south-east (as the crow flies, the drive is more roundabout). Hamburg's dark sites provide plenty of other destinations in the area, and Bremen's Bunker Valentin or the Emigration Center at Bremerhaven aren't far either. Combinations with non-dark destinations: in general see Germany – the immediate vicinity of the site isn't the most touristy of the country, which is flat and rather featureless in these parts, but it's not too far to Bremen, Hamburg and the popular heathlands of the Lüneburger Heide – or the coast. What is it? 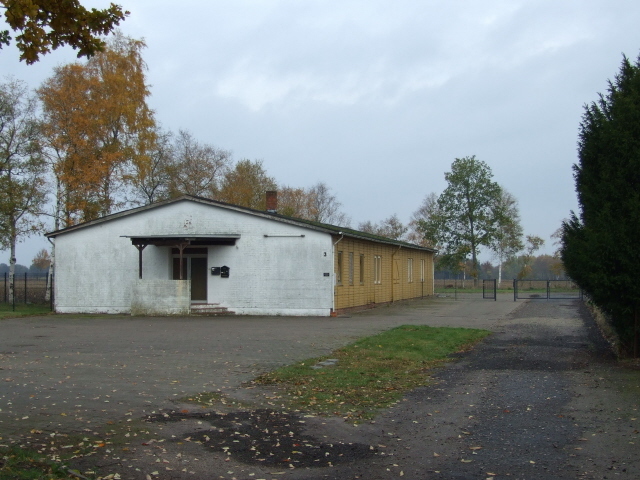 A former Nazi WWII POW camp, later overflow concentration camp, in fact one of the most significant such sites in northern Germany. What the much better-known Bergen-Belsen camp memorial site lacks, Sandbostel still has: namely surviving original structures, esp. 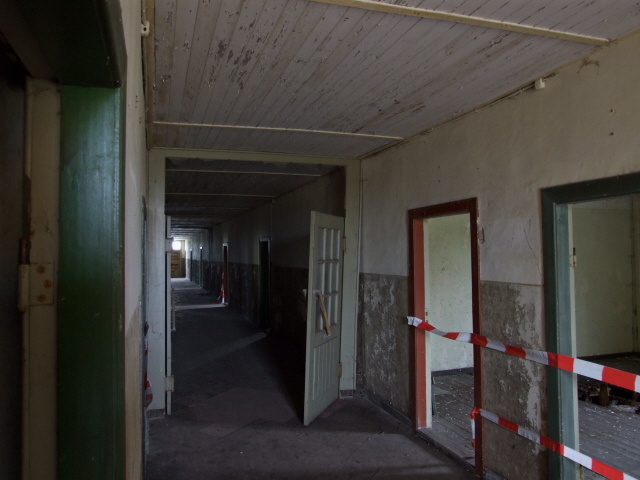 barracks, which are currently being restored. The documentation centre at Sandbostel too is still a work in progress, but is already quite remarkable. Up to 70,000 prisoners were crammed together at any one time in the camp (which had originally been planned for 10,000). Conditions were predictably atrocious. The death rate was, naturally, particularly high towards the end of WWII when the camp was overcrowded, supplies were running out and the camp was also used (just like Bergen-Belsen) as an "overflow" camp for the inmates "evacuated" from concentration camps further east (e.g. from satellite camps of Neuengamme). Since 2007, there's been a proper little museum at the site, and temporary special exhibitions, housed in the original barracks, augment the main one, which is housed in a more recent red-brick building. The centre's staff are extremely committed – and plans are afoot to expand the exhibition and rehouse it in a fully restored barrack. The preservation society intends to purchase more of the original buildings not yet in the possession of the memorial centre and restore those too, as far as is possible. But money is short, as can be expected at such a relatively obscure place. It is thus all the more important to support the preservation work at this underrated but immensely significant site. So if you go, do use the donations box provided. 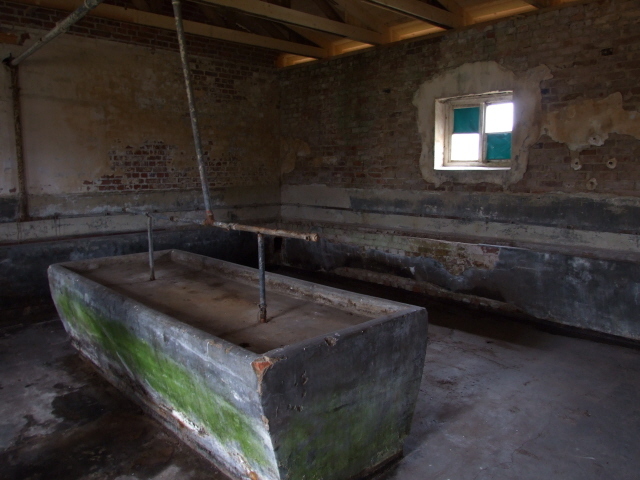 What there is to see: The premier attraction of the Sandbostel site is the fact that here, a row of original camp barracks has been preserved – which is an extremely rare thing! 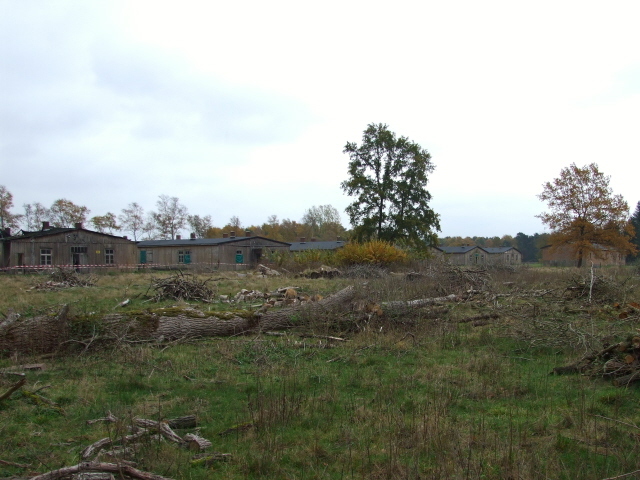 The better-known and more popular Bergen-Belsen site, for instance, has none – and even at those camp memorial sites that do have barracks, these are typically reconstructions, not originals. So this really sets Sandbostel apart. 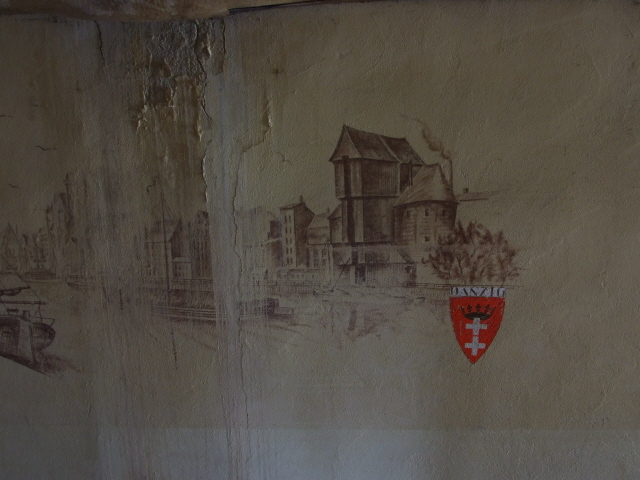 You can wander along the wooden barracks – and can also see the inside of at least one of them … look out for the intriguing wall paintings (e.g. of Gdansk sights or East German cities' coats of arms – apparently left from the days when GDR refugees passed though the camp). Restoration work is in progress, so things will change and more parts will probably be made accessible in the future. In one of the stone buildings, an old wash room has been preserved. Other buildings look almost beyond repair … but that actually adds a certain element of dark atmosphere in its own way. Other than the buildings themselves, there's a regular exhibition/documentation centre in a non-original building on the site, by a former church. It may not be a particularly exhaustive exhibition, but what they do have is quite impressive. In addition to photos, charts, maps and texts (in German), there are also finds on display which were dug up at the site, such as metal soup bowls and spoons, name tags, empty Red Cross food package bags (those were only for the Western POWs, never for the Russians! ), and, most impressive of all: paintings and drawings by inmates, some of which capture the atmosphere of camp life better than any descriptive texts could. One painting says: "a minor Belsen" – but when you look at the double row of barracks stretching out of view into the misty plain, it doesn't look all that minor at all. 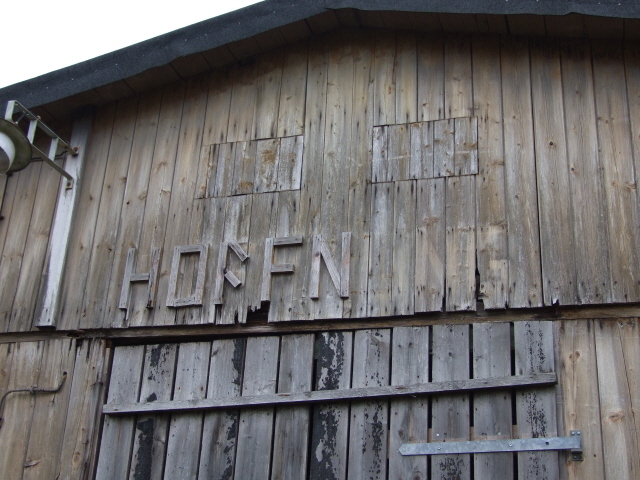 One or two of the wooden barracks (there are also stone ones – but they're even more dilapidated) are usually open to the public, at least in part, and contain temporary exhibitions – when I visited (in October 2009), this included some ultra-rare original documents from the build-up to WWII and everyday life under the Nazis. In a small cinema room back at the documentation centre, a set of short films can be shown. The first two items are ca. 5 to 10 minutes long each – and contain silent footage shot by the British liberators in April/May 1945. These are pretty self-explanatory – but the memorial's staff may also provide extra commentary. A third film is a somewhat longer piece (ca. 20 minutes) from German television. It's a documentary about the site which features a woman who, like may other "ordinary" Germans, was sent into the liberated camp by the British after liberation to work – namely clear the camp and look after the remaining sick ex-inmates. Her reading from her diary notes she had written back then as a 17-year-old are particularly revealing and touching. Also featured are two Brits, who were with the occupying forces then. One speaks English – but it's dubbed into German. So if you don't know the language, you can either skip the longer documentary or only watch for the atmosphere derivable from the visual. At the entrance there are (slightly dated) leaflets in a set of languages (including English, Polish and Russian) which briefly recount the site's history. Other than that everything's in German only – but the staff are working on expanding their language catchment capacity. Guided tours in English can apparently be arranged by prior appointment (for contact see under access). Location: At Greftstraße 5, a bit over a mile / 1.5 km south-west of the actual village of Sandbostel, which is some 20-25 miles (30-40 km) east of Bremerhaven and ca. 40 miles (65 km) west of Hamburg. Access and costs: a bit remote, requiring a car to get there; but free – details: to get to Sandbostel you'll need to have your own means of transport. From the main motorway between Hamburg and Bremen (A1), get off at exit 49 (Bockel) and take the B71 towards Zeven. Pass through Zeven and carry on along the B71 until you've passed through Selsingen, where you turn left towards Sandbostel. Follow the signs to "Gedenkstätte"/"Kriegsgräberstätte" – at some points it'll say only "Gewerbegebiet (Immenhain)", but that's where the memorial site is. It's a bit less than a mile / 1.5 km past Sandbostel village proper, but on the approach you can already see the row of barracks to your left. Just before you get to Heinrichsdorf, turn left into the premises of the industrial estate and proceed straight ahead, until another sign points towards the memorial site proper, where there are a few parking spaces. Time required: If you can read German you can easily spend something like two hours here (depending on the size of the temporary exhibitions). If you cannot, then much less will do, maybe a quick glance at the exhibition's pictures and other self-explanatory items, watch the two silent films and walk around the former camp grounds and the barracks – altogether perhaps 30 to 45 minutes. Combinations with other dark destinations: in general see Germany – also in Sandbostel is a "war cemetery" ('Kriegsgräberstätte"), which is actually the camp's cemetery. A Soviet memorial commemorates the many Soviet POWs who died at Sandbostel camp. But the most significant thematically and, at a push, geographically combinable other site will have to be that of Bergen-Belsen, which is about 60 miles / 40 km further south-east (as the crow flies, the drive is more roundabout). Combinations with other non-dark destinations: in general see Germany – the immediate vicinity of the site isn't the most touristy of the country, which is flat and rather featureless in these parts, but it's not too far to Bremen, Hamburg and the popular heathlands of the Lüneburger Heide – or the coast.